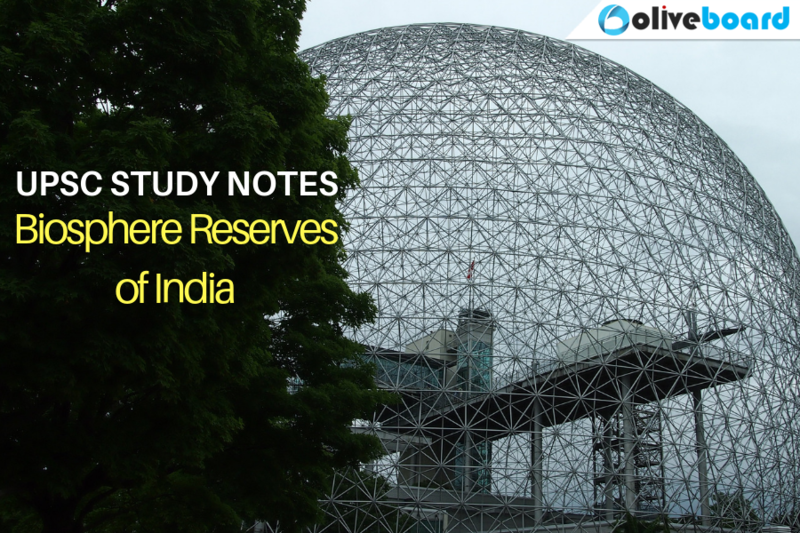 Biosphere reserves of India form an important topic for the UPSC CSE preparation. This blog post covers all important points about it. Biosphere Reserve (BR) is an international designation by UNESCO for representative parts of natural and cultural landscapes extending over large area of terrestrial or coastal/marine ecosystems or a combination thereof. BRs are thus special environments for both people and the nature and are living examples of how human beings and nature can co-exist while respecting each other’s needs. These areas are internationally recognized within the framework of UNESCO’s Man and Biosphere (MAB) programme, after receiving consent of the participating country. To ensure the conservation of landscapes, ecosystems, species and genetic variations. To promote, at the local level, economic development which is culturally, socially and ecologically sustainable. Development of community spirit in the management of natural resources. India has created a network of protected areas in the form of 96 National Parks, 510 Wildlife Sanctuaries, 28 Tiger Reserves and 25 Elephant Reserves. The area covered under protected area network accounts for around 5% of the total geographical area of the country. The rich biodiversity in India has given shape to variety of cultural and ethnic diversity which includes over 550 tribal communities of 227 ethnic groups spread over 5,000 forest villages. The national Biosphere Reserve Programme was initiated in 1986 and its aims and objectives are described in the following sections. To bring out representative ecosystems under conservation and sustainable use on a long-term basis. To ensure participation of local inhabitants for effective management and devise means of improving livelihood of the local inhabitants through sustainable use. To integrate scientific research with traditional knowledge of conservation, education and training as a part of the overall management of BR. To ensure sustainable use of natural resources through most appropriate technology for improvement of economic well-being of the local people. Also Read : How to Prepare Art and Culture for UPSC 2019? A site that must contain an effectively protected and minimally disturbed core area of value of nature conservation and should include additional land and water suitable for research and demonstration of sustainable methods of research and management. The core area should be typical of a biogeographical unit and large enough to sustain viable populations representing all tropic levels in the ecosystem. Areas having diversity of soil and micro-climatic conditions and indigenous varieties of biota. The core zone is kept absolutely undisturbed. It must contain suitable habitat for numerous plant and animal species, including higher order predators and may contain centres of endemism. Core areas often conserve the wild relatives of economic species and also represent important genetic reservoirs. The core zones also contain places of exceptional scientific interest. A core zone secures legal protection and management and research activities that do not affect natural processes and wildlife are allowed. Strict nature reserves and wilderness portions of the area are designated as core areas of BR. The core zone is to be kept free from all human pressures external to the system. 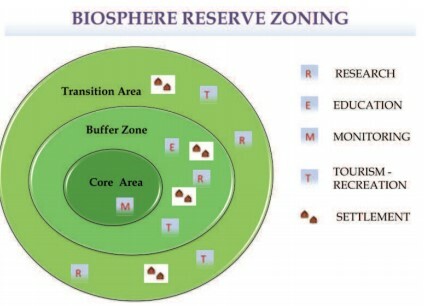 In the Buffer Zone, which adjoins or surrounds core zone, uses and activities are managed in ways that protect the core zone. These uses and activities include restoration, demonstration sites for enhancing value addition to the resources, limited recreation, tourism, fishing and grazing, which are permitted to reduce its effect on core zone. Research and educational activities are to be encouraged. Human activities, if natural within BR, are likely to be permitted to continue if these do not adversely affect the ecological diversity. The Transition Zone is the outermost part of a Biosphere Reserve. This is usually not delimited one and is a zone of cooperation where conservation, knowledge and management skills are applied and uses are managed in harmony with the purpose of the Biosphere Reserve. This includes settlements, crop lands, managed forests and area for intensive recreation, and other economic uses characteristic of the region. In Buffer Zone and the Transition Zones, manipulative macro-management practices are used. Experimental research areas are used for understanding the patterns and processes in the ecosystem. Modified or degraded landscapes are included as rehabilitation areas to restore the ecology in a way that it returns to sustainable productivity. Nine of the eighteen biosphere reserves of India are a part of the World Network of Biosphere Reserves (* marked in the above image), based on the UNESCO MAN and the Biosphere (MAB) Programme list. It must be noted that the BR is not intended to replace existing protected areas but to widen the scope of conventional approach of protection and further strengthens the Protected Area Network. Existing legally protected areas (National Parks, Wildlife Sanctuary, Tiger Reserve and reserve/protected forests) may become part of the BR without any change in their legal status. On the other hand, inclusion of such areas in a BR will enhance their national value. Hope this gives you all the information you need. Start your UPSC 2019 Preparation with a Free UPSC Mock Test!